in their ranges but are still manufactured to the same high standards as their other products. With prices starting below £1,000 these offer good value for money. Just check out our selection of low priced twin axle movers. Full installation service available on all models. 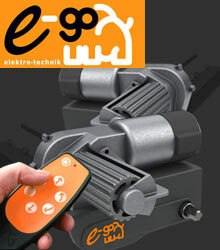 Looking for cheap single axle models? the Purpleline Enduro Quattro, the E-Go All Wheel Drive or the Powrtouch All Wheel Drive Twin. 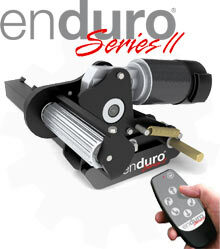 The New lighter Purpleline Enduro Series 2 for twin axle caravans. Simple remote directs the caravan into any position. 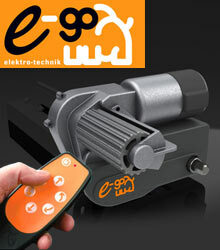 Manoeuvre your twin axle caravan effortlessly with the e-go electric remote control system. 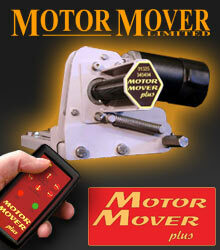 The Motor Mover Plus is so versatile that a caravan can be turned within its own length. The Motor Mover Plus is designed to be as unobtrusive as possible, and offers excellent ground clearance. Don't want to fit your twin axle mover yourself? No problem! 4 wheel drive for twin axle caravans! 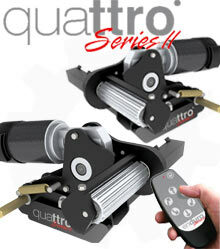 Quattro control system turns like no twin axle van has the right to! As far as agility is concerned, it has more in common with a single axle caravan mover, with the ability to almost turn on itself. Full installation available on all models throughout the UK.